Ather Sharif is a computer science graduate student at Saint Joseph University in Philadelphia, PA. Originally from Pakistan, Ather was in a car accident in 2013 in North Dakota where he was pursuing his Master's degree. The car accident left him paralyzed. Since then, Ather has relocated to Philadelphia and is now living by himself in an apartment close to his school. 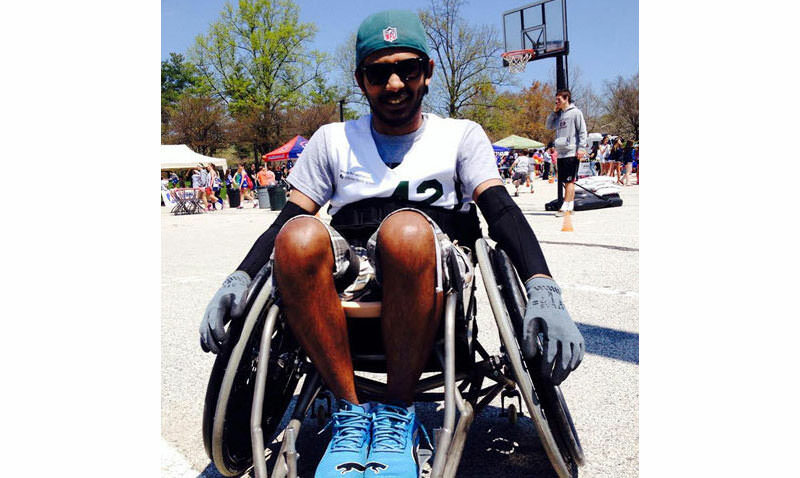 Just two years post-injury, he joined Magee Rehab Hospital's quad rugby team and created the SCI Video Blog site http://www.scivideoblog.com through which he has built a virtual platform for other people with SCI so they can share resources and learn from others. "I was injured due to a car accident in March 2013. I'm originally from Pakistan and was attending University of North Dakota as an international graduate student during that time. All my family is back home so I had to go through the whole process of rehab by myself," he recalls. But he was not completely alone. 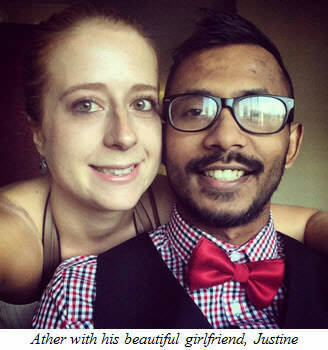 "I had Rashid and Yasmeen (they reside in NJ), friends of my uncle, and Justine, my significant other, by my side through most of the rehab and recovery process. Without them, all this would have been impossible," he said. "I went through an emergency surgery and was in critical condition at the hospital in Fargo, ND for three weeks and then transferred to Magee Rehab in Philly for rehab. Once here, I went through two more surgeries at Jefferson Hospital." "I was discharged from Magee on July 10, 2013 only to be re-admitted at Jefferson for a serious condition known as sepsis on July 12. I spent my 24th birthday (July 15) alone in the hospital." "Having gone through all these stages of life alone, I built incredible endurance and strength, which has helped me since then," said Sharif. "Over this same time period, I have lost many friendships and made new ones. I believe such a time is when relationships are truly tested. It's been a huge eye-opener for me, but I'm glad I was given the opportunity to filter out the people who really mattered—even though it was the hard way." "As far as making new relationships is concerned, I believe we're in an era where people are becoming more aware of disabilities. They hardly see that as a limitation and so the person shouldn't either." "My advice would be to just be yourself. If you go to a classroom and sit in the corner being afraid to mingle, people get the vibe that you want to be left alone. Hence, nobody talks to you." "But if you go sit in the middle of the classroom, participate and mingle, they immediately open up. Dating is very similar. People like to help people who help themselves and when they see you strive forward, they want to be more involved in your life." "SCI can be considered a tragedy—but not a trademark. Spinal cord injury has never been a limitation, but my attitude was. People shouldn't stop doing what they like to do." "I was slower, yes, but ten times smarter. This is what spinal cord injury does to you. It takes away a few things but gives you more in return. You just have to figure it out." 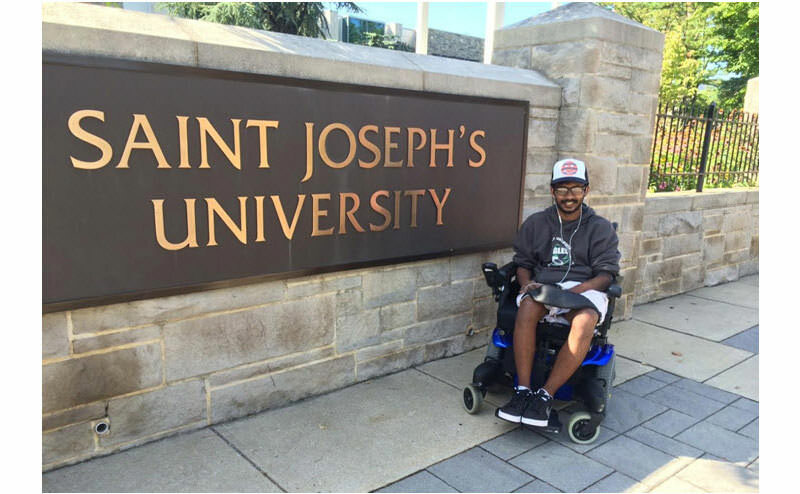 "Currently, I am attending Saint Joseph's University as a computer science graduate student. On January 1st, I launched EvoXLabs, which is an initiative to serve the community of Philadelphia through web technologies. We aim to provide people with vision impairment an improved web experience, and we provide the non-profit organizations of Philadelphia free websites and webapps equipped with modern and completely accessible tools." Ather submitted his research to the Web for All Conference on accessible graphs. The research presentation is at: https://www.youtube.com/watch?v=bnACsbcbUxY. Author's note: Wheel:Life publications center on sharing resources and support for people who use wheelchairs. In this Wheel:Life excerpt series, you'll hear from people who use wheelchairs as they share their perspective on friends, family and relationships including dating, marriage and parenting. 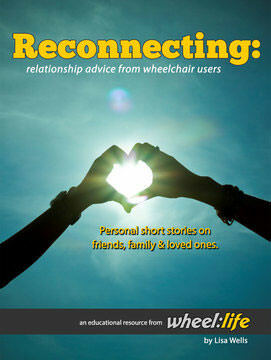 Get the full story in the Wheel:Life book titled "Reconnecting: Relationship Advice from Wheelchair Users." Request a free copy at: http://wheel-life.org/book-request-form/free-book-series/reconnecting-book-form/.